It all comes together on the construction site, but how do green building policies play out in the hands of the builders? An integrated design process and green specs should bring the contractors on board with the project's green vision, but you still need to follow through to make sure that the job is done right. Make sure that both the general contractor and the subcontractors have the skills and information to turn a green design into a high-performance building. For the site work: landscaping--with native and drought resistant plantings--stormwater management, materials use, and waste management. Finally, evaluate the work as it proceeds, from start to finish, to ensure the quality that will make this development and future projects green. 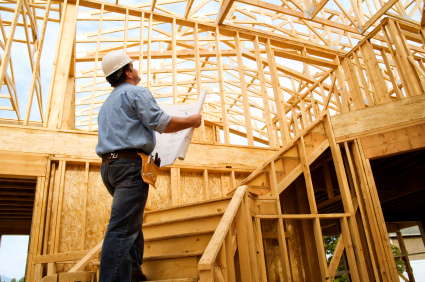 Check that the general contractor and subcontractors are equipped to do the job right. After all, one worker's mistake can result in years of moisture problems, or a building envelope that leaks away the investment in efficient heating and cooling systems. Emphasize that at least the general contractor is part of team design meetings and that the subcontractor selection process checks for green experience. Make sure that the construction documents and specifications are clear and detailed and that contractors have the opportunity to resolve issues quickly. Emphasize proper installation of insulation, careful sealing, and detailing. Determine who will oversee the construction site. Hopefully, the architect and engineer will make frequent site visits to provide both support and oversight. A commissioning agent who makes scheduled inspections of the work is a valuable resource. Construction itself has considerable environmental impacts: stormwater runoff, air pollution from dust and exhaust, damage to trees, and waste. Regulations already require mitigation of some construction site impacts. Inspection and performance testing during construction are essential to ensure that an affordable housing development will truly be green. Go to the next page for a discussion of evaluation approaches and tools.